Really stoked to give you guys a peek inside what comes in a FabFitFun box! This is hands down one of the coolest subscription boxes I’ve seen. Because it’s seasonal, they pack a lot of rad stuff into one amazing set. When I received my box, it was honestly like a clown car of products, combined with an epic Christmas morning. Like an endless stream of goodies. Mind you, these aren’t sample size products. I have an ipsy subscription, which I love, that sends sample sized beauty products once a month. It’s cool to test stuff out, but the things they send you are pretty tiny. As someone who considers themselves a lover of all things fab, fit, and fun (lol), this box was a dream! Full size beauty products, workout equipment, and fun accessories for every day? Sign me the f up! A set of 2 Gold Radiance facial masks from Passport to Beauty ($65) – This alone is more than the price of the box in its entirety! Doctor D. Schwab Flawless Skin Fluid moisturizer ($39) – It’s like a serum and moisturizer in one, and it smells really nice. Fancy! Manna Kadar Liplocked Priming Gloss Stain in Lucky ($24) – it’s like a liquid lipstick. Super dope. Tribe Alive Bracelet ($49) – I’m picky about jewelry, but this thing is actually SUPER cute. Really delicate and pretty, with gold metal. Merrithew Total Body Tone DVD + Strength Tubing ankle cuff ($33) – time to dust off the DVD player and hook it up so I can try this out. I love that I got to add to my equipment collection. Purple Purse Charm ($10) – this is to raise awareness around domestic violence, such an amazing cause. You can check out the charms here. I love that they incorporated philanthropy. Picture it On Canvas $75 + free shipping Gift Card – getting myself some photo prints for the holidays! Jeweler’s Wife $15 + free shipping Gift Card – they have Alex & Ani and House of Harlow! Pretty excited about that. So essentially, you’ll get a $300-$400 box of product, from beauty to fitness and a lot in between. They haven’t shown what’s entirely included in the Winter box, but they’ve leaked that there will be Frends earbuds (~$80), Whitney Eve gloves (basically priceless), and a scented diffuser (~$37). Go hop on it before it sells out! Get your first box for $10 off – use the code “BEACH” at checkout and get a bunch of sweet goodies for $39! Feeling like coupon queen right now. 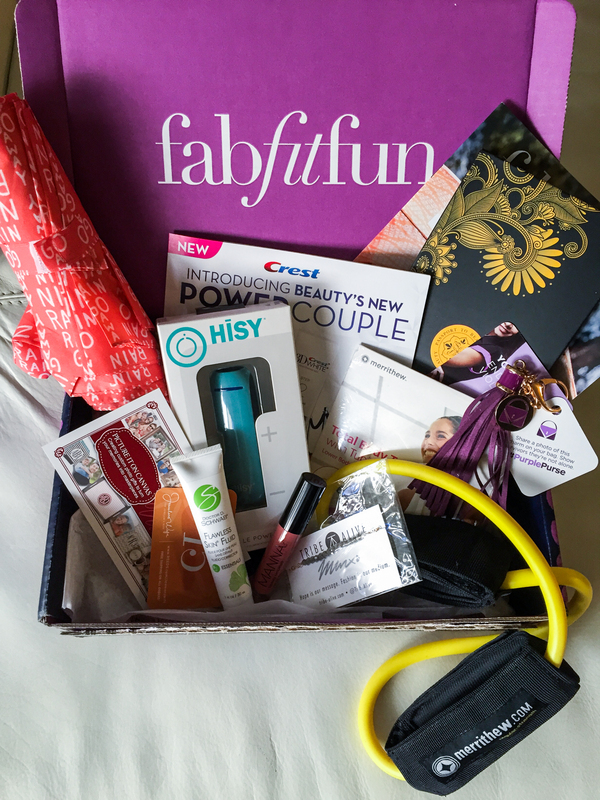 Thank you fabfitfun for providing this box for review! I’ve always wanted to try one of these subscription boxes… and I honestly think this one is the best deal and you get amazing things!! Great review!